Mountain Area Regional Transit Authority (Mountain Transit) provides local bus service in Rim of the World and Big Bear regions in San Bernardino County. Communities served includes Big Bear Lake, Crestline, Lake Arrowhead, and Running Springs. 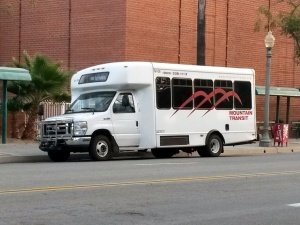 Mountain Transit also provides regional service from those Rim and Big Bear to the City of San Bernardino, where it connects with Omnitrans, Metrolink, Amtrak, and Greyhound. See bus schedule for zone info. Senior and disabled fares are half of regular fares. This page was last edited on 21 November 2018, at 03:03.